Monday’s One-Minute Fiction challenges you to write a story in one minute, no more, no less, based on the prompt provided. For the next several weeks our prompts will be Alaska themed. 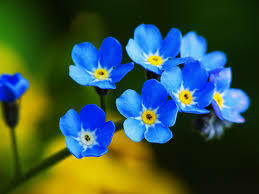 This week’s prompt is the state flower: Forget-me-not. How could I? Your bold blue color is my favorite of all colors. When I look at you, I see the twinkle in your eye -that only my eye can see and I humbly say to you… forget me not…for you are my reflection of myself. You’re welcome. Thanks for hosting.